Perhaps Sherlock Holmes was part vampire. It seems that no matter what Sir Arthur Conan Doyle did to get rid of him, the public demanded more Sherlock Holmes. So, following a tradition that would be repeated in movies and TV shows too numerous to mention, Sir Arthur was forced to reincarnate him, or at least explain why his certain death at Reichenbach Falls was not quite what it appeared. He had to keep inventing more stories of his famous detective to pay the bills and satisfy his fans, even though he was bored to tears with his character. Even turning him into an opium addict would not cool his readers’ ardor for Holmes. Sir Arthur eventually met his maker but Holmes proved immortal. Sherlock Holmes books never go out of print. Most of his stories have been made into TV shows; many have been reprised in plays. There is probably no more frequently recurring character in the movies. Most fans would agree that no actor did a more memorable job of portraying Holmes than the late Jeremy Brett, who along with Edward Hardwicke (who sadly died last month) as his sidekick Dr. Watson acted in various BBC Sherlock Holmes series produced between 1984 and 1994. Real aficionados require a complete set of DVDs to enjoy over and over again. No, you can’t kill Sherlock Holmes, just like you can’t seem to kill a vampire or Star Trek. You can’t kill their reincarnations either. Still, it’s getting harder and more expensive to do period Sherlock Holmes movies. Recreating a late 19th century London is expensive. So perhaps with the death of Edward Hardwicke the timing was right to reimagine Sherlock Holmes cast in modern times instead of the 19th century. That’s the premise behind Sherlock, a slim Sherlock Holmes series from the BBC now on its second season which is, in a word, terrific. Its limited availability here across the pond is probably inhibiting more widespread knowledge, as is its very limited “season” (three episodes each in 2010 and 2011). An actor with a name every bit as peculiar as Sherlock Holmes, Benedict Cumberbatch, gets to create a modern day Sherlock Holmes at the same address of 221B Baker Street, with the same side kick Dr. Watson and the same landlady Mrs. Hudson (Una Stubbs). It’s just that it all takes place about a hundred or so years later. This reincarnation and modernization of Sherlock Holmes is strangely and unusually compelling and is in many ways better than the series featuring Jeremy Brett. Freed from its 19th century constraints, and a fifty-something version of Holmes (Cumberbatch is 34) we get a much more fun and in many ways more interesting interpretation of Sherlock Holmes. And strangely, it all works so very well. Lord of the Rings fans quickly forgave Peter Jackson for casting Frodo with an actor thirty years younger than the character in the books. You will quickly forgive creators Steven Moffat and Mark Gatiss for casting Cumberbatch as a younger version of Holmes, putting him in the modern day, and for removing his pipe (although he does wear three nicotine patches to get a similar high). Still, I do see similarities with the last BBC series. Cumberbatch’s interpretation of Holmes is about thirty percent Jeremy Brett. There are times when watching him act that you see a younger Jeremy Brett. Like Brett’s interpretation of Holmes, this is not a detective who can stay for long in a stuffed chair. He is like a panther, constantly in motion, his mind always racing ahead of the rest of us. And he is completely comfortable with technology, with his smartphone ready at hand. All the characters you have come to know and love are generally around, including his gifted brother Mycroft (who shows up in the first episode) and even the evil Moriarity (who shows up early, in episode three), but also Inspector LeStrade (Rupert Graves). Mrs. Hudson is a whole lot more fun than the dowdy lady who is usually portrayed as well. Perhaps the most welcome change in this recasting is with Dr. Watson, now a fully fleshed out human being played by Martin Freeman. This Dr. Watson is a war veteran too, but of the Afghan war, and navigates through London’s infamous fogs in a mental fog of his own. He’s not quite the starry-eyed intellectual lightweight that Sir Arthur portrays him, but a guy with issues whose life almost through happenstance gets wrapped around Sherlock Holmes. Holmes brings him some measure of the crazy excitement he found in Afghanistan. Nonetheless, this is principally a series about Sherlock Holmes and fans should not be the least bit disappointed by Cumberbatch’s portrayal of the detective. It is every bit as good as Jeremy Brett’s but still distinctive and in many ways much more fun. Holmes’s sexual identity was always suspect. 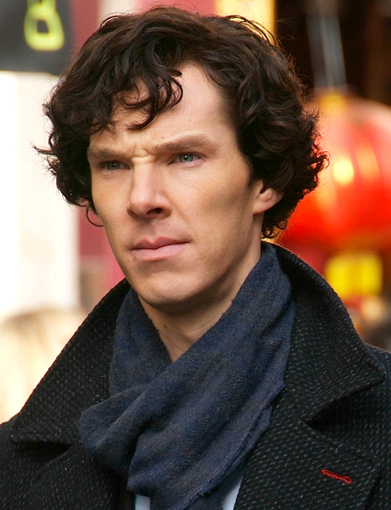 Cumberbatch portrays a Holmes more asexual than sexual; it’s just way down on his list of priorities. Besides, it seems there is no woman out there who can begin to keep up with him. When he is on a case minor matters like eating and sleeping simply recede. If you have cable TV, there is a good chance you have BBC America as well. If so, check its schedule carefully so you can sample the series. Or throw caution to the wind and order its slim set of DVDs. Even if they can only produce less than a handful of new episodes per season, you will find them worth the wait. Sherlock transcends mere television. Whatever this reincarnation is, it is really, really good. If you are a Sherlock Holmes fan, you’ll kick yourself if you don’t drag yourself out of Edwardian England and enjoy this contemporary version.